Before I went to Vietnam a lot of people told me that I wouldnt want to see so much as a grain of rice for months afterwards. For those not so keen on rice this definitely wasnt the case. 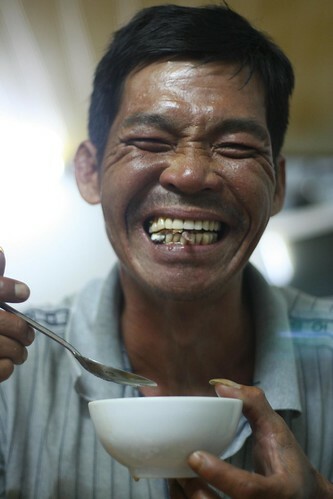 Theres plenty to eat that is not rice, as long as you are keen on noodles! The food, like the coffee was fabulous and addictive in its freshness. 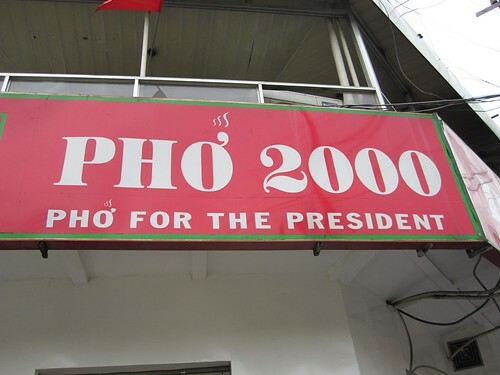 The minute we hit the hotel the first stop was Pho 2000 a speciality pho shop that was seriously and very rightly proud of serving Pho to Bill Clinton on his visit to Ho Chi Minh city. Even veggie daughter Chelsea had some pho at the time, although after a few weeks in Vietnam Im pretty sure that there was no such thing as a vegetarian pho and that all pho is made with a good stock using plenty of bones! 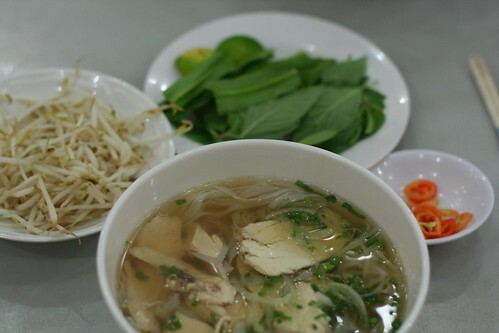 Pho is almost always served with plates of fresh herbs, chillies, lime wedges and bean sprouts. Its an incredibly tasty and complexly flavoured broth with rice noodles and meat. Saying this, after having almost a bowl of this a day the quality varies massively, its all down to that initial stock and the spices that are used in the making. When I asked at the cookery school we visited about pho recipes I was told that it would take 3 days of teaching to learn how to prepare the perfect stock No surprise then that a lot of places that serve pho (and many other places for that matter) serve only one or two dishes in total. 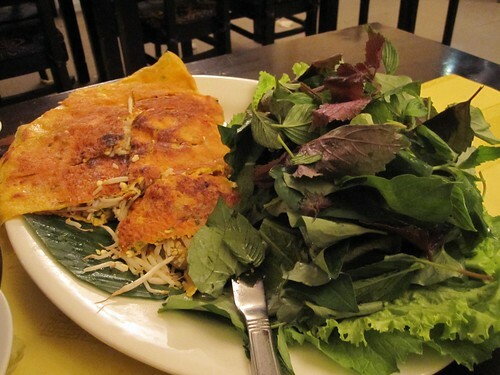 One of the places I was most excited to visit in Saigon was Com Nieu Sai Gon which came heavily recommended by Anthony Bourdain on his show . 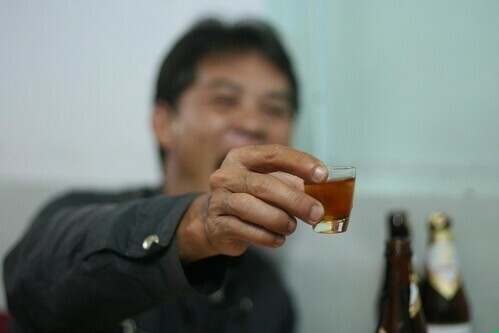 This place was the first and only place that I tasted Ban Xeo, which had been much recommended before going to Vietnam. 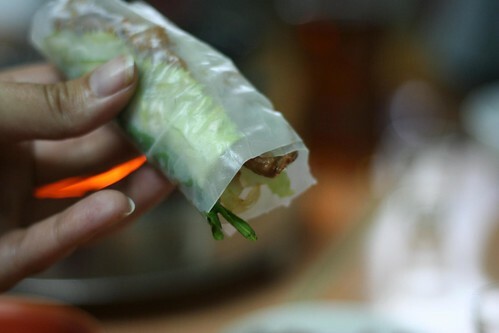 When the plate arrived I didnt have a notion that what you are meant to do is wrap the pancake stuffed with bean sprouts, bits of pork, shrimp in the many different leaves to the right before dipping in fish sauce. What cant be seen in the picture is the very fat rat that crawled out from behind our table after our first few bites. I didnt get to finish the Ban Xeo but wasnt crazily keen on trying them again after seeing the rat. The best thing we did foodwise was take a 4 day motorbike trip up through the central highlands in Vietnam. Once we got out on the road every bite we ate was very local and extremely fresh. We saw fruit and veg grow on either side of the road for 200 odd kilometres every day. The picture on the left is of the food that was brought to our table at a truck stop miles away from anywhere. The bits that I remember from this were chicken cooked in a clay pot with lemongrass and chili, morning glory, an omelet, a veg soup with beetroot and some fried pork - all amazing. This trip was where we also had one of our more interesting restaurant visits with our guides. We had absolutely no idea what we were going to as we walked down an alleyway between houses to a building that looked like it had been built in someones garden. The only thing we knew is that chances were we wouldnt be getting a menu. 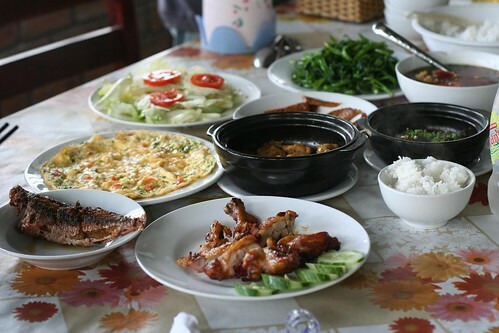 Soon after we arrived a little gas burner was brought out with plates of seasoned goat meat with lettuce leaves, sliced green banana, starfruit slices, cucumber, tomatoes, loads of fresh herbs and rice paper pancakes. Little bowls were brought out with fish sauce, birds eye chillies and satay sauce for dipping. Our guides fried up the goat and instructed us on how to dampen the pancake, what to add and how to roll (one of my better specimens above). There is always something quite fun about making your own dinner and having plates of such fresh ingredients to chose from made this my tastiest as well as most fun meal washed down with quite a lot of banana rice wine. 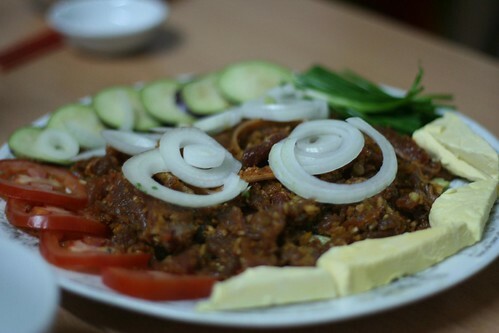 As I quickly learned to say "Ngon lam" (pronounced mon lamb) - that was delicious. The best however was yet to come. I was fairly squeamish about this so Im going to put these photos behind that little "read more" link down there. Whether or not you read on, dont forget to enter the competition to win some Vietnamese coffee! So we couldnt quite figure out why our guides were being quite so generous with the pancakes until more food came out. Again plates of herbs, rice and egg noodles, tofu and veg were delivered along with a big pot of broth with some goat meat for the gas burner. Strangely a big bowl of duck eggs was also brought out. 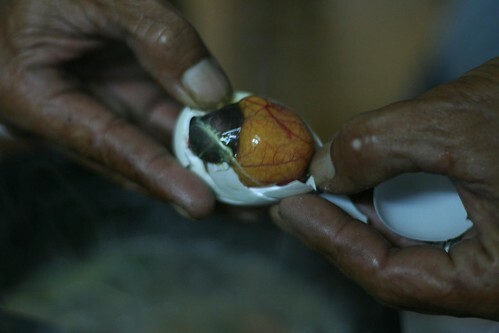 Now I had noticed men at a neighbouring table cracking eggs into their pot earlier on but hadnt been able to see what was going on up close so I was a little surprised to see that it wasnt just egg white and yolk that came out when cracked into the pot of broth.Instead it was an almost fully grown duck foetus within the shell. This foodie with her dodgy tummy hid behind the camera from here on in. 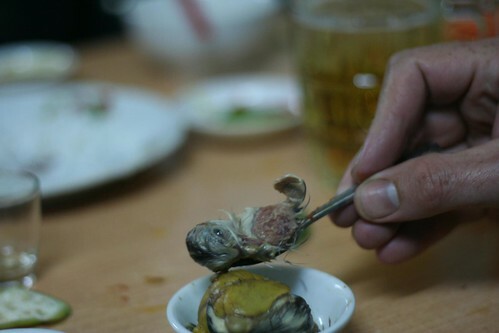 I wasnt able to do much more than taste the goat soup and there was no way I was having any of the duck foetus. Not even a wee nibble of fur and beak were going to pass my lips! Heres my guide Anh delighted to model the eating of some duck foetus for me!